This is the 4th volume in the series spanning 8 years and now reached a total of 200 unissued tracks. 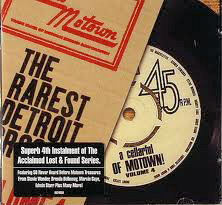 They have still managed to uncover some very good ballard's, instrumentals and great Motown dance sounds. Very good booklet with notes by Paul Nixon. Issued on Tamla Motown 8824009 2 CD set.